Xprt is active across Canada and North America on demanding projects. The problem was to communicate the core of their philosophy: seeking the best combination of technology and design. Presentations and pictures don't fully transport the advantages. Xprt created an Experience Centre in which the full performance spectrum of the integrator can be experienced. Xprt presents design and technology best-cases. TeamConnect Ceiling and SpeechLine Digital Wireless are a part of the high-end showroom. Making technology and design an experience – that’s the goal of the "Experience Centre" operated by Xprt Integration of Vancouver. The Canadian integrator uses the 2000 sq ft showroom to demonstrate an optimized combination of interior design and technology. This best-case scenario presents only selected merchandise. Various Sennheiser products, including the TeamConnect Ceiling flagship, are waiting to be experienced. Profile Xprt is a renowned system integrator from Vancouver, Canada, specializing in innovative technology solutions for enhancing working spaces, conference rooms and homes. 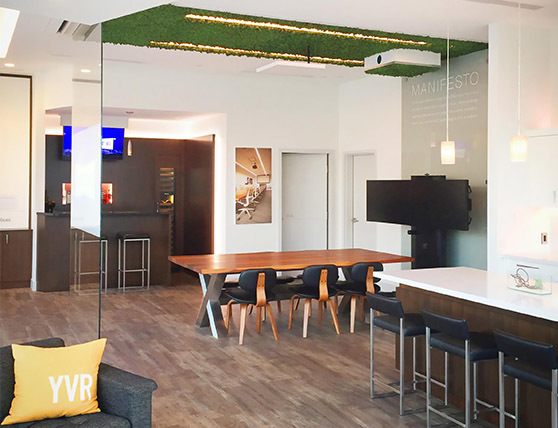 This high-end strategy adopted in Vancouver is effective, Xprt has customer projects throughout North America: conference rooms, lobbies, fitness studios and private households. Owner Daniel Sacks: "We define value via quality and this is a principle our customers really appreciate." Clients previously found that technologies fell short of product promises, which is why they put their faith in experts who have high quality standards and can guide them through the complex world of technology. There was one problem even Xprt could not solve straight away: product descriptions, presentations and photos weren’t up to getting across the message about what technology properly combined with good design can deliver. To fix that, Xprt built their Experience Centre in 2014. They invested half a million Canadian Dollars in constructing a 2000 sq ft showroom at their HQ. Since then, the Experience Centre combines unified state-of-the-art technologies incorporating light, presentation technologies and video conferences in both a commercial and a residential environment. The Xprt team’s maxim: top quality and ease of use in combination with invisible technology. Daniel Sacks: "Our customers don't want to see thick cables snaking everywhere, they want to have a beautiful ambience - at home and at work." All products showcased in the Xprt Experience Centre pass stringent quality requirements. Solutions must be innovative, emphasizes Mr. Sacks. They must improve on predecessor products, be better than the competition and pass all tests set by Xprt's in-house team of engineers in the Xprt lab. "Most products don't make it into the room," Sacks says, "for the others, it’s an honor." Many Sennheiser products feature in the Xprt Experience Centre, including headsets, handheld and wireless boundary mics from the SpeechLine Digital Wireless series. Xprt flush integrated the microphones in the conference table top made of Walnut wood. Xprt designed all microphone trim panels themselves and had them 3D printed. One product quickly approved for the Experience Centre was Sennheiser's TeamConnect Ceiling microphone solution. Daniel Sacks and his colleagues were "impressed". It is the first viable approach to solving the problem of having to set up too many microphones in one room - with speakers always having to turn their heads to a specific mic. "TeamConnect Ceiling means people can stand where they want, turn their heads where they want," enthuses Daniel Sacks. It is finally possible to "use the room completely naturally.". His expectations of TeamConnect Ceiling were actually far exceeded in practice, a rare occasion he admits himself. In the opinion of these Canadian design enthusiasts, products like TeamConnect Ceiling represent an almost optimum combination of form and function. Daniel Sacks and his Xprt colleagues are happy with Sennheiser products for a number of reasons. Sennheiser puts quality above quantity, says Sacks, and as a result Sennheiser's products also beat those of other manufacturers even when cost is a factor. Sennheiser basically shares core values with Xprt, which explains why the Vancouver people admit to being "very pleased" about their partnership with the German manufacturer. Daniel Sacks explains that there are not many brands he is aware of which boast best-in-class products in so many fields. Xprt customers like the Experience Centre. The showroom puts emotions into the technological experience, just like a test drive, explains Sacks. Customers quickly come to realize that good technology, like the TeamConnect Ceiling, actually solves problems; they see how a solution can be integrated into a room to create an aesthetic result. 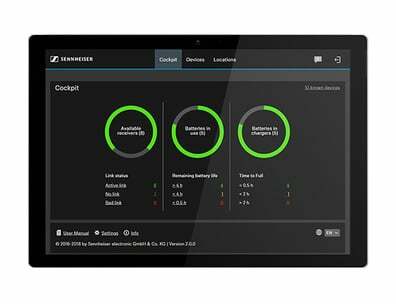 Visitors are frequently handed an iPad that controls the room, and asked to navigate it themselves without training to plainly demonstrate the simplicity achieved by the Xprt-developed control app.